The title alone is enough to sell this book to legions of multi-generational Scooby Doo fans the world over. It’s become part of mainstream canon, an everyday part of life that almost everyone who grew up watching television from the early seventies on is familiar with. 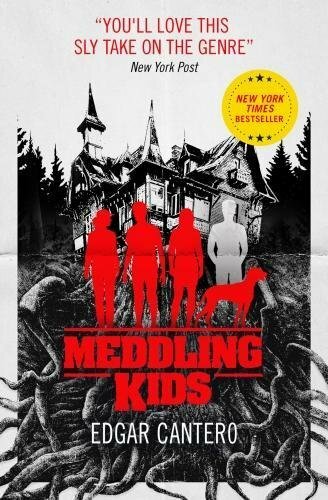 Instantly conjuring up images of intrepid young investigators, haunted houses and masked criminals posing as monsters, Edgar Cantero’s choice of title wasn’t accidental. 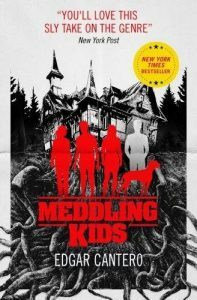 Meddling Kids revolves around, and uses that, image as a launching point for its central premise and builds its incredibly enjoyable and multi-tentacled plot around the populist idea of young detectives and their faithful mutt solving all manner of crimes that have stumped and befuddled their adult counterparts. But as good as the juvenile investigators were, the one case that made them famous is the same one that has haunted them their entire lives and left them feeling that there was something that they missed, something that wasn’t quite right about the way it ended. And thirteen years later, they return to the scene of the crime to find out what it is that’s plagued them and what really happened in that abandoned, derelict old house and why things continue to go bump in the night so long after the original case was supposedly closed. *Yup, I know that Dixon was a publishing house pen name used by a number of authors to write the Hardy Boys books. But at the end of the day, that’s the name on the cover, so that’s all that matters, right?